Last long run. A lot has changed since this 16 week journey began. Our running group faced and conquered many challenges over the course of this training season. Perhaps the most difficult and obvious obstacle was a harsh winter that brought freezing temperatures, snow, ice and sleet. But that wasn't the only obstacle. We ran up long hills, traversed city bridges more times than I can count, and even had to deal with a sudden heat wave a few weeks ago. Our last run of 10 miles had a cool start to the morning. But it was a beautiful morning! 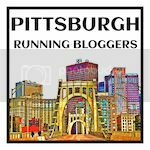 We ran through the neighborhoods of Shadyside, Point Breeze and East Liberty. Once we reached Oakland we starting seeing University of Pittsburgh graduates taking photos around campus. Dressed in caps and gowns you could see pride beaming from their faces. Maybe even more happy were the faces of their parents. It was pure joy. It made me feel hopeful, inspired and renewed. We were enjoying our run so much in fact, we got lost. Not just a litte lost, but, "Crap I'm two miles away lost." So there really no choice but to run back. Although the extra two miles didn't bother my legs any, it did bother me mentally. I had ten miles in my head and I was ready to be done. I thought I would be enjoying a latte by now. At the time I was mad, but the more I thought about it, I realized that it was a good lesson to learn one week before the marathon. Things won't go perfectly during the marathon. I doubt I will get lost, but I may lose an energy gel, or have my shoe come untied. Heck, I might even put my shorts on backwards the morning of the race. But it's not going to do any good to get upset or mad. I'll just be wasting energy. The marathon is a long race and I'm going to have to work through a solution whenever I encounter obstacles. All of us, whether first time marathoners or repeat marathoners have defeated an obstacle in our path. The last run is always exciting, but for me it's also a little bit sad. I'm sure I'll learn to appreciate sleeping past 6 AM on Sundays once the marathon is over, but maybe in a perfect world, we would never get tired, we would never be hurting and we wouldn't have real world responsibilities so we could continue to conquer the roads of our great city. Most of the people I've trained with I don't know outside of running, but I know their stride, I know their favorite hat or running jacket. I know if they are running their first or second marathon. You form a special bond when you run with people. You look at each other and you understand the sacrifice, the determination and the pain. You understand the lack of a social life on Saturday nights. You understand waking up in the dark and running in 17 degrees while the rest of the world sleeps. You understand constantly checking the hourly weather forecast for Sunday mornings. You don't question each others' goals. You know that you are here to simply be a better version of yourself. All of this I will miss, but I know the end of the marathon is not the end of our running journey. It's just another chapter in our story. Running a marathon is extremely difficult. It can be grueling, intimidating and painful. But it also can be joyous, beautiful and amazing. What could be more amazing than achieving something that once seemed impossible? For this reason, the marathon is just the beginning. And once you conquer the marathon, you will know that you can do anything you put your mind to. Even what once seemed impossible. During the past two years I&apos;ve had the pleasure of running the city of Pittsburgh. I&apos;ve discovered new places and unique views within the city I love. I&apos;ve also realized that running has put me in unusual places at unusual times. Normally I would not be on the West End Bridge on a Sunday morning in the winter. But thanks to running, I find myself there and am able to witness a beautiful skyline. Below are a collection of my favorite photographs of the City of Pittsburgh. The photos were taken with an iPhone and edited with Instagram. All photos were taken "on the run". Enjoy. View of Pittsburgh from West End Bridge. Andy Warhol Bridge one week before the 2013 Pittsburgh Marathon. Allegheny Cemetery along Penn Avenue. View of Pittsburgh from 31st Street Bridge. West North Avenue in Pittsburgh's North Side neighborhood. View of West End Bridge from North Shore. View of downtown from Station Square. View of "The Point" from Station Square. October 1, 2013 should have been an ordinary fall day. A Tuesday in Pittsburgh marked with the first day of October, most would have expected to be filled with thoughts of the Steelers and anticipation of the Penguins. Maybe it would have been a nice day for a walk to see the leaves changing or a great day to start looking for Halloween costumes or pumpkins. After all this was the way of life in Pittsburgh during fall in October. But October 1, 2013 had something different in mind. It would be one of the greatest days in Pittsburgh sports history. That&apos;s not an exaggeration. When your baseball team has not had a winning season in 20 years and your ballpark has never hosted a playoff game, it&apos;s not an exaggeration. When you have no memory of a winning baseball team and no playoff games to remember because you were nine years old (now thirty years old) when it last happened, it&apos;s not an exaggeration. The Pirates had been bad for as long as I can remember. Not just bad, but basement dwellers. "At least we&apos;re not the Pirates," was a common theme among other struggling baseball teams. PNC Park opened in 2001, my senior year of high school. I remember going to the rooftop of the Gateway Clipper during my senior prom to catch a glimpse of the new ballpark from the Allegheny River. It was magnificent. Unlike Three Rivers Stadium which was a concrete enclosed oval, that was isolated from it&apos;s surroundings, PNC Park was open to the river, embracing the city as the game was played. We waved as our boat floated by. The crowd cheered and waved back. Once PNC Park opened, many flocked to see the new ballpark. "Go see the new stadium. It’s beautiful." were common phrases uttered. It was truly beautiful, but it was also an empty shell. On good days it was only half filled. In college, it was a popular place to go on a date, or go with friends. But you always planned something to do afterwards because you never intended to watch the whole game. Usually the outcome, losing, was decided in the 5th or 6th inning and it was a safe bet to leave. PNC Park, even in all its glory seemed like a soulless place. It was a constant reminder of what we didn&apos;t have - a legitimate baseball team. Even when I finished college and moved out of state in 2007 the questions couldn&apos;t be avoided, "What&apos;s up with the Pirates?" People would ask, knowing my loyalty to Pittsburgh Sports teams. "I don&apos;t know," I would reply. But I did know, all too well. They were terrible and there was no end in sight. When my husband and I lived in Central Pennsylvania we were able to watch the Pittsburgh Sports Channel (FSN). Sometimes he would watch the Pirates on TV. "Turn that off, " I would say. "Why are you wasting your time?" (The 2010 Pirates lost over 100 games.) The truth is that I didn&apos;t want to watch because it hurt to watch. The losing didn&apos;t even hurt as much as the players body language. They didn&apos;t want to be there and that really hurt. It was shameful and embarrassing. It wouldn&apos;t have hurt so bad if they had always been terrible, but they used to be great. Our parents talked about the great teams and the great one, Clemente. What would he think of this? But we didn&apos;t have any of that greatness. All we (the Pirates lost generation) knew was losing. In 2011, I started hearing rumblings of the Pirates being in first place in the division. It was July. This was unheard of. Usually the Pirates were irrelevant at this point in the season. On July 8, 2011 my husband and I stared at each other in shock as we watched the Pirates come from behind in the 8th inning to beat the Cubs. Who were these Pirates? They certainly weren&apos;t the ones we had known most of our lives. Unfortunately a 20 inning loss in Atlanta proved to be the beginning of the end for the 2011 Pirates. In the beginning of 2012 we were thrilled to be moving back to Pittsburgh. Living near the city meant we could enjoy all things that came with city life. This included attending Pirates games. We secured tickets for the opening day against the cross state rival - Philadelphia Phillies. Although they lost, these Pirates looked distinctly different from the years past. We started going to games in May and June with friends. But instead of just something to do, we were going to watch a baseball team. It all came to an exclamation point on July 8, 2012. It was the last home game before the All Star break. The opponent was the San Francisco Giants. The pitching was stellar and the offense went on an assault. The final score was 13-2. PNC Park was jumping. Nothing like this had been seen here before. By the time August rolled around we had been to quite a few games and someone was beginning to take notice - the Pirates. I remember when my husband said they had called and wanted us to come down to take a tour of the ballpark. We knew there would be a sales pitch to buy season tickets, but we were already going to a lot of games so we wanted to see what they had to offer. I remember the night we toured the park because it was also a Steelers preseason game. We walked against the crowd to reach PNC Park. Seeing the inside and outside of PNC Park made me appreciate it even more. That night we discussed buying season tickets. The price was reasonable and we were already attending a lot of games. We decided to go ahead and make a deposit for the 2013 season. Then in September, the Pirates went on to lose over 20 games and experienced the worst collapse in MLB history. I started to wonder if we made a mistake. When April 2013 rolled around we were excited to start attending games again. The Pirates got off to a slow start but quickly got on a roll. Beginning of the season momentum for this team had become the norm over the past few years. The question was would they be able to maintain it? In June, the Pirates had the best league record and were the first team to 50 wins. When July showed up, the Pirates sent 5 players to the All Star game. This was the most all stars on the Pirates since 1972. My husband and I really enjoyed going to the games. Being a season ticket holder made things easier. You already had your tickets so you didn&apos;t have to decide what games to go to or where you wanted to sit. All you did was grab the tickets and go. When my husband couldn&apos;t go to the games, I invited my mom. My mom and I had never been to a game together when I was growing up. I&apos;m sure the Pirates losing ways contributed to us never attending a game. But now when we attended games, we felt like we were kids again. We laughed and giggled, watched fireworks and took silly pictures of ourselves. I&apos;ll never forget how much fun we had. The Pirates kept rolling through the season and by August they were in the playoff hunt with the Cardinals and the Reds. I looked up the standings daily. By the time September came it was apparent there would be no late season collapse. Then one day playoff tickets came in the mail. It was really happening. Playoff tickets were in your hands. The Pirates were going to be in the playoffs. It was just a matter of who and where they would play. The last few weeks of September were a constant battle for position in the standings. It started to shape up that the Pirates and Reds would play each other. It was just a matter of if the game would be played home or away. The sports writers and analysts claimed it didn&apos;t matter where the Wild Card game was played. Everyone in Pittsburgh knew that couldn&apos;t be farther from the truth. It mattered to the fans to have it at home and I think the players felt that too. If the Wild Card was played in Cincinnati there was a risk of no playoff game being played in Pittsburgh and that would be just devastating. We would have no opportunity to show our excitement and appreciation for the team that finally broke the losing streak and made it into the playoffs. We got our answer on the last Saturday of September - PNC Park would host its first ever playoff game on Tuesday, October 1, 2013. By Monday morning the players had sent out a message - Blackout at PNC Park. When Tuesday came we were all ready to go in our black t-shirts. We took our preferred method of transportation, the Pittsburgh Trolley. As we traveled to the game I was excited, but also nervous. I was going to my first playoff baseball game. It felt so foreign to me. I didn&apos;t know what to expect. But I knew many others felt the same way. Playoff baseball hadn&apos;t been here in twenty years. We got off the train at the North Side station, only a block away from PNC Park. We started walking up the stairs with the mass of people dressed in black also attending the game. That&apos;s when the chants began, "Let&apos;s go Bucs! Let&apos;s go Bucs!" It was loud and echoed throughout the station. It was two hours before game time. Once we arrived outside of PNC Park we met up with some friends and walked along the river. Boats were docked with pirates’ flags waving in the sky. A large flag hung from the Clemente Bridge. Federal Street was packedwith a sea of fans in black jerseys and shirts. It was electric and there was a buzz in the air. It felt like it was going to rain, but there was no storm coming. Or maybe there was. At seven o&apos;clock we decided to go into the park. The game wasn&apos;t until 8 o&apos;clock, but when you haven&apos;t seen playoff baseball in twenty years, you don&apos;t want to miss a thing. As we watched the crowd stream into PNC Park, the atmosphere started to build. Some carried signs. Some carried flags and some were dressed from head to toe as pirates. Random chants of "Let&apos;s go Bucs" were heard as groups walked by. By seven thirty we decided to go to our seats. That&apos;s when the ceremonies began. Soon after we sat down, the Reds were announced. Loud boos came out from the crowd when they were announced. But soon the booing changed to chants of "Let&apos;s Go Bucs! Let&apos;s Go Bucs!" It continued throughout the introduction of the entire Red lineups. It was so loud; you could barely hear the names called out. Now it was the Pirates turn to be announced. I looked around and the ballpark was filled. Everyone wanted to be there when the Pirates were announced. The chants were so loud and getting louder. "LET&apos;S GO BUCS!" It continued throughout the entire lineup with exception of McCutchen who was greeted with "MVP." The only thing that made the chants stop was the singing of the national anthem. Petrina McCutchen, Andrew&apos;s mom, would sing. It was beautiful. It was the kind of rendition that brings tears to your eyes. Towards the end of the anthem the stadium started singing along with her. I think it was the fans way of saying thank you to her and her son. Soon the Pirates took the field and the chants began again, "LET&apos;S GO BUCS!" The sound came pouring out. We had waited twenty years for this. We couldn&apos;t wait anymore. Liriano looked spot on. The Reds were swinging away and couldn&apos;t connect, but neither my husband nor I would mention how good Liriano looked. We didn&apos;t want to spoil anything. "We&apos;re at a Pittsburgh Pirates playoff game." I kept saying to him in disbelief. But something even more amazing was about to happen. It was the second inning and Marlon Byrd came up to bat. He had been producing big time for the Pirates since they had picked him up from the Mets. Numbers had shown he was also good at hitting Cueto. He connected with a ball and you could tell by the sound it was going far into left field. Home Run! Fireworks went off. Black towels waved in the night sky. People gave each other high fives. This is just the start we needed. Once we returned to earth, Pedro was next up to bat. He connected and the ball was coming high and far towards center field. A roar came from the crowd until it dropped down into the center fielder&apos;s glove. Russell Martin was next up to bat. But Cueto couldn&apos;t throw a strike. His control was off and the crowd could sense it. That&apos;s when it started "CUETO, CUETO, CUETO". To say it was deafening might be an understatement. It was all you could hear. It was so loud and eerie. "This is brutal" I tried to shout to my husband. I looked back at the pitcher’s mound and there was Cueto staring at his dugout or maybe just above his dugout. It was a prolonged look. "What&apos;s he looking at?" I thought to myself. And then all of a sudden the ball was on the ground and he was running over to grab it. "What happened?" my husband asked. "He just dropped the ball." I replied in amazement. I had never seen anything like it before. This brought a roar to the crowd who were quite pleased with themselves. The chants only became louder. He wound up to throw… the next…pitch….. HOME RUN! Fireworks went off. Black towels waved. Flags waved in the sky. People jumped up and down. People ran up and down the stairs in the ballpark. High fives were seen everywhere. Twenty years of frustration came out in screaming and yelling. PNC Park would never be the same. The Reds never seriously threatened. They were never truly in the game especially after the two home runs heard all over Western Pennsylvania. Martin would go on to hit another home run to add to what was becoming the party on the North Shore. Grilli came on the mound in the 9th inning to close the deal. And when the last out was recorded and the Pirates won, I cried. I cried because what I never thought would happen, became a reality right in front of me. I cried because I finally had a memory of playoff baseball and it was a good one. I cried because one game had erased 20 years of losing. It was the end of mediocre baseball. It was the end of terrible baseball. There would be no more of it. The biggest game in PNC Park history would no longer be some meaningless All Star game. This was now the biggest game in PNC Park history and it was epic. How epic was it? I can tell my future children and grandchildren that I was at the first playoff game in PNC Park history. I can tell them that, we, the fans chanted Johnny Cueto&apos;s name so loud, we caused him to drop the ball and give up his 2nd homerun of the game on the next pitch. I can tell them that I saw Francisco Liriano slice and dice through the Cincinnati lineup and be written into the Pirates history books. And that once the celebratory fireworks had ended, the stadium emptied into the nearby streets. Joyful fans clad in black, waving towels ran through the streets screaming, "Let&apos;s Go Bucs!" Some fans were so elated they ran down the street giving high fives to people sitting in their cars. Some danced on the rooftop of their cars and one even jumped off the Roberto Clemente Bridge. And in the midst of the celebrations I started to realize I was part of something special. No, not just special, something extraordinary. Maybe even life changing, when you consider you just witnessed something you never thought possible. When all you knew for two-thirds of your life was a losing team and watched that reality dissolve right in front of you, your perspective starts to change. If this is possible, what else can be achieved? As we walked to the Trolley station, I took some glances back at PNC Park. It was gorgeous, light up in the October sky. The ballpark that has a 21 foot high wall in right field and a statue of the great one at the entrance finally had a soul. And you couldn&apos;t help but smile and think that if he were still here on October 1, 2013, he would be proud of this team and this city. 20 Miles. The last "long" run of marathon training was here. Some days, it felt like it would never come and then all of a sudden it appears. The marathon countdown goes from months to weeks. The weather suddenly turns and the marathon is right around the corner. Speaking of weather, in typical Pittsburgh fashion we went straight from winter to summer skipping over spring. Hello 80 degrees! Yep, that was the predicted high for today with the low being in the 60's. Last Sunday's run, I was scraping a frost off my car window. This week I was in shorts and a tank top. Not exactly a smooth transition. Our Fleet Feet run started at Peet's Coffee and Tea in Oakland. We started our run from Peet's Coffee and Tea in Oakland. This was the same location for our first run of the training season. Today was a stark contrast to that day as it was just 19 degrees. For this training run we covered the entire second half of the marathon course. I was really excited about this because the second half of the course was where I really struggled last year. I wouldn't call it a complete crash and burn, but let's just say the wheels were coming off. This run would be a good chance to battle some of those remaining demons from last year. We started out at a nice easy pace. It's important to conserve energy on these long runs. Before I knew it we were five miles into our run and at our first water stop along South Braddock Avenue. After our first water stop, we headed under the railroad bridge into Homewood. After our first water stop we continued into Homewood and then turned left onto Frankstown Avenue. Last year, this was where the wheels started to fall off for me. It was interesting to see the course on fresher legs. I think I had worked it up in my mind to be much harder than it was after last years race. Was it challenging? Absolutely. Was it doable? Totally. Around Mile 7 rain starting coming down. Since it was warmer I thought it felt pretty good. Fortunately it was just a light sprinkle and didn't turn into a downpour. The temperature was rising as the sun shown brightly at our water stop in Morrow Park. We contined on our course to the Higland Park neighborhood and then back to East Liberty. We reached our next water stop at Mile 10. Halfway there. After the water stop we continued through Bloomfield and down Liberty Avenue through the Strip District. In my mind, the Strip Distirct is without a doubt the toughest part of the course. It's long and flat and it feels like you're never going to make it back to downtown. I kept my head down and just kept putting one foot in front of the other. By Mile 13 I knew I wasn't drinking enough water and I had already drank all the water in my hydration belt. I just focused on making it to Mile 15 which was our next water stop. Once at the stop, I started gulping as much water as I could and taking another energy gel. I needed a severe boost to get through the next five miles. I also made sure to fill up my water bottle before we left. View of the Point State Park fountain. After crossing the Fort Duquense Bridge we ran through Point State Park and continued all the way to Fort Pitt Boulevard and then to Smithfield Street Bridge. After crossing, we made an immeaduate left onto East Carson Street. Now at Mile 17 we were back on part of the marathon course. Ugh. It was hot. Not only was it hot, but it was busy. People were everywhere; coming out to enjoy this beautiful day. The bars and restaurants were packed. Windows were open and I could see patrons enjoying their day. They were having brunch. They were drinking bloody Mary's. They were having fun. I was suffering. I was in the pain. I wasn't having fun anymore. I never thought I would be so happy to see the Birmingham Bridge, but I knew it was my ticket back to Peet's in Oakland. At this point, I knew things were not going to get better. Things don't get better at Mile 19. Things get better when you get done with your run. I tried to maintain my pace over the long bridge. Finally, I reached the crest and the downhill makes things easier although it hurts a little more. I shorten my steps to ease the impact. Next up is the Oakland Hill. I take a few walking steps to get on the sidewalk. I want to get back to Oakland. I'm going to run this hill. Slow and steady I go up the hill. The trouble is it steepens the further you go. C'mon. Get up this stupid hill! I vocalized my thoughts. I grunt. I'm pulling out all the stops to get up this hill. I pick out objects to run to: a sign, a street, a bus stop. Before I know it, I'm there and I can see our meeting point. As I reach Peet's, I look at my watch. It says 19.90 miles. Oh heck, no. This watch is going to say 20 miles. I keep running down the block, dodging pedestrians to get my 20 miles. At this point I may be slow, but I'm on a mission. Finally, a beep on my Garmin goes off, the number 20 appears and I feel like I've conquered the world. I don't see 20 miles often on my Garmin, so I had to take picture. By the time I finished the run, the temperature was 75 degrees. After a brutal and cold winter this heat wave took a toll on me. I knew it was going to be warmer and was hydrating more, but I was still surprised by how much water I needed. After this run, I felt really prepared for the marathon. I had overcome a lot of obstacles. I knew the sudden heat wave would be difficult for me, but I was glad it happened. I know what mistakes I made today and how to correct them if we have a warm day for the marathon. I also overcame my fear of the second part of the course. Running it again made me realize that it is manageable, but I just need to be really conservative in the beginning of the race. Also, I&apos;ve totally debunked the myth of the Oakland Hill. If I can run that entire hill at Mile 19, then you better believe I can do it at Mile 11. From here on till race day we begin our taper, which means cutting back the miles. Now is not the time to push it. The hard work is (mostly) done. Now is the time to stay consistent, run shorter distances, recover and rest up for the big day. And after today&apos;s run, I have all the confidence I need to do just that. For any Fleet Feet runner the words "Tudi Run" invokes fear, hesitation and excitement. The Tudi Run is challenging, intense and long. While the course is challenging, it is a great way to prepare for the marathon; because nothing in the marathon is as daunting as what is encountered in this run! The 18 mile run began in McKees Rocks. Once departing McKees Rocks we took Island Avenue (not sure where the island was) to Chartiers Avenue. Chartiers Avenue is a long and winding hill (perhaps could be considered a mountain?) to the Sheradon neighborhood of Pittsburgh. I wanted to run up this hill as much as I could but once I realized my "running" was the same speed as others walking, I decided to save my energy and walk up a portion of the hill. After reaching the top, a long downhill was very enjoyable before reaching yet another long uphill. This time we climbed the hill into the neighborhood of Elliot. Fortunately, yet another downhill gave me a chance to recover and catch my breath. We were already five miles into the run, and had climbed two massive hills. On all the long runs, I tell myself that I'm only running to the next water stop. I knew we were close to our water stop and then I saw a blue tent for our first stop. But this wasn't your ordinary training run water stop. This was a "race like" water stop sponsored by Brooks (yes, the running apparel company) and it was glorious! Our water saviors were dressed in grass hula skirts and beach apparel. Maybe Island Avenue took us to a Brooks Island?!? This water stop made me smile and completely forget about those last five miles and two hills. Our first water stop was sponsored by Brooks. After the much needed boost from the water stop we ran through the West End taking the steps down from the West End Bridge to East Carson Street. I was happy that it would be a while until we would see a hill again. The chilly morning was giving way to a beautiful Sunday. After an oppressive winter, the sun is finally shining, and signs of life are being seen around the city. We ran past a soccer game at Highmark Stadium and even ended up in the midst of a race on the Three Rivers Heritage Trail! View of downtown Pittsburgh from Station Square. Our next water stop was in Uptown, directly across from the Birmingham Bridge. Nearly ten miles into the run and I was feeling pretty good! The "Welcome to Uptown" sign on Fifth Avenue. There are many murals in this neighborhood, including the welcome sign. We then headed downtown and through the Strip District. After crossing the 16th Street Bridge, we headed to the North Side. This nieghborhood is one of my favorite parts of the marathon course. Although parts of the North Side have been neglected over the years, I think it has some of the most picturesque streets in the city. Liverpool Street in the Manchester neighborhood. After our scenic run through the North Side, it was onto our final water stop at Mile 15. I really needed this one! The sun was coming down and it was getting warmer. I definitely needed to hydrate and fuel with a gel. After the water stop I was ready to tackle the last three miles of our run. We started our final hill climb up California Avenue. Ouch. This hurt. Although this hill was not as steep as the hills we encountered in the beginning of the run, it was long and seemed never ending. A sliver of hope appeared as I could see the McKees Rocks Bridge in the not-so-far distance. I kept my eyes fixed on the bridge as I conquered the hill. I just had to get there and the down slope of the bridge would carry me to the end of this run. It seemed like it took forever, but I got to the top of the hill at Brighton Heights Avenue. From here it was all downhill. In a good way! We crossed at the traffic light and headed over the Ohio River via the bridge. As we crossed the bridge, I stopped to take it all in (and a few pictures.) At this point I knew I had conquered this run and it was an exhilarating feeling. The McKees Rocks Bridge over the Ohio River. Once we arrived back to our starting point I couldn't help but feel accomplished. Last year I really struggled with this run, but today it felt different. It felt like I had conquered the Tudi Run, instead of it conquering me. The next day I was really tired and sore. I could tell that I had done a tough run the day before. As the mileage has been increasing on the long runs, I have been taking two rest days during the week instead of one. Training for my second marathon has been a lot different than training for my first. I listen to my body. I know when I need to rest and when to push. Hopefully this same knowledge will serve me well in the marathon. In January I started to hear the phrase "the open" being used around my crossfit gym. I had never heard of "the open" before, but it seemed to be a competition of some sort. Did you go somewhere to do this competition? I envisioned a large venue, like a gymnasium with bleachers, and lights shining brightly down on you. Then I found out "the open" was a series of workouts announced online and could be completed in the comfort of my home gym, Mt. Lebanon Crossfit. Still, I was unsure. I didn't think I would have much to offer to the open workouts, but I was willing to be a cheerleader for others. Our coaches suggested we give it a try. It would be a good way to measure our progress from year to year. It seemed like most people at the gym were signing up. I finally gave in and signed up; with my biggest reason being that I didn't want to be left out. Before the open began I had two wishes for myself: to be able to compete in one, maybe two, of the workouts and to not make a fool out of myself. Obviously, I was setting the bar pretty low, but I didn't know what to expect. Here are four things I learned during the crossfit open. 1. I am capable of more than I thought I was. As mentioned above, I was hoping that I could compete in one or two of the workouts. As it turned out, I was able to compete and get a score in every one of the workouts. In fact, I was able to do all but two of the movements included in the open workouts. Eleven for Thirteen? I'll take that any day. 2. I am stronger than I thought I was. I've competed in a lot of competitions that have tested my physical abilities. But I had never tested my weight lifting abilities until Workout 14.3. It included box jumps and deadlifts. Heavy deadlifts. It's hard to put into words what I experienced during this workout, but I found a part of myself that I didn't know existed. I struggled. I was in pain, but somehow I lifted the heaviest weight I've ever lifted in my life. Now I know I have much more strength than I ever thought. 3. I have a lot to work on. So, I already knew this one. There are many crossfit skills that I have yet to develop. But during the open I realized how one skill can make or break you. This became apparent during Workout 14.4. It included a skill called "toes to bar". I had just achieved my first "toes to bar" a week earlier. Now I had to do 50 of them in a row. I couldn't do them in succession, so I attempted them one at a time. A lot of my attempts resulted in my toes not touching the bar. At the end of fourteen minutes I had only managed fourteen reps. I ended up with a bruised ego and skin missing from my hands. Although it was a disappointing performance, it made me want to work harder and improve on my weaknesses. 4. There is inspiration all around us. So often in life we get busy. We have tasks to complete and often we don't notice the great things others are doing around us. One philosophy that has been stressed in Crossfit since I joined the gym is that once you complete your workout you must encourage others until they are done. On the last night of our open workout (complete with an after-party) my friend, Christina, was the last athlete completing the 14.5 workout. She's the main reason I was here in the first place, as she encouraged me to join only months earlier. Now she was struggling. Standing less than five feet tall, completing 84 thrusters at 65 pounds (more than half her body weight) was a daunting task. Everyone else in the gym had recovered from their workout and had found a bite to eat. But she didn't care. She turned her back to the buffet of food and the ticking clock. It was one of the most gutsy and grueling performances I've ever witnessed. She couldn't always get the weight overhead, and that was consuming time and energy. She attacked each thruster one at a time. By the time she had three thrusters left to complete the entire gym had gathered to watch this epic finish. It took one hour and eighteen minutes. She never waivered. She never gave up. She had achieved something remarkable. And it was in those final moments of her workout, it hit me. For most of us, the open wasn't about the numbers. It wasn't about how much we could lift and how quickly we could complete it. It was about life. It was about being better today than we were yesterday. It was attempting something that seemed impossible and conquering it. It was accepting a challenge and completing it. No matter how long it would take. It was facing fear and doubt head on, and defeating it. It was the realization that we were stronger and better than just five weeks ago. It was realizing that we can be even better than we are right now. Now that was something we could all aspire to be.